Properties in Prellet Ski Lift average 4.6 out of 5 stars. Welcome to the cottage in the friend! Property 13: Welcome to the cottage in the friend! FIR / A pretty apartment in light wood very warm with a mezzanine. Property 33: FIR / A pretty apartment in light wood very warm with a mezzanine. Gite in a renovated farmhouse in La Clusaz. Property 36: Gite in a renovated farmhouse in La Clusaz. Excellent location within five minutes of ski busses and one minute of great bars and restaurants. The ice cave train is also very close. 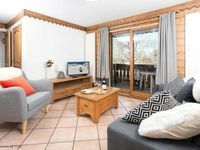 The apartment is perfect for budget have it all Chamonix ski holidays as it has separate bedrooms and bathrooms and use of the pool and spa next door. Beth and all the team at Chamonix All Year were excellent and really professional. I would highly recommend them to any potential stayer! 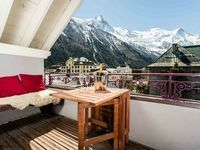 I have been to Chamonix seven times and this is the best apartment yet. Well-equipped and comfortable apartment with top-notch location. Lovely balcony with splendid view over Mont Blanc. Friendly neigbours. Very close to SuperU etc.